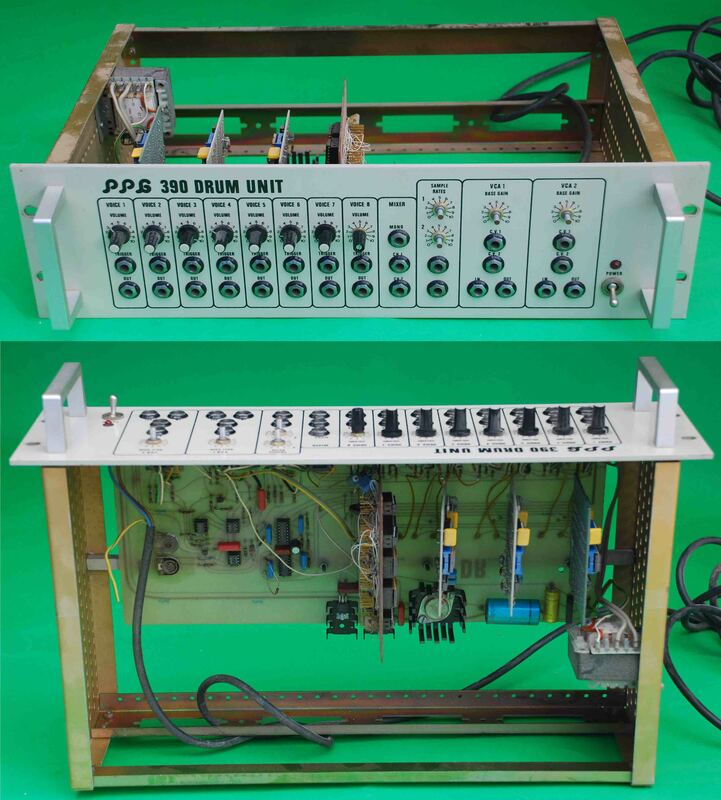 This page displays the information available for the Ppg-390 drum unit (rare prototype, n/p) (Sphere item # 5738). Description NB: THIS MACHINE IS A PROTOTYPE AND HAS NO PROPER CASING. IT IS ELECTRICALLY UNSAFE WITHOUT PROPER SHIELDING. ONLY BID IF YOU ARE A TECHNICIAN OR WILL HAVE IT MADE SAFE BY A TECHNICIAN BEFORE USE. 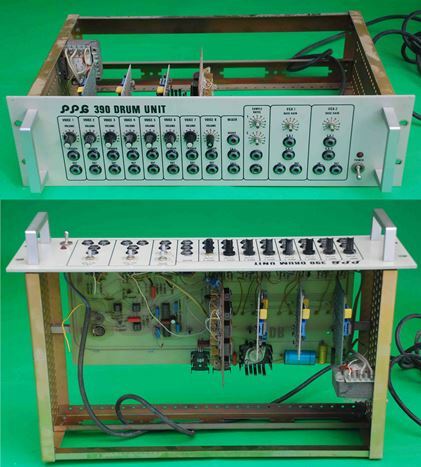 Incredibly rare early PPG drum unit. Search for this on the internet and you will probably find evidence of only one machine - this one! Check the photo to see exactly the same knob pieces missing. The front panel (apart from the little bits missing on one knob and the four knobs missing on the right) is in excellent condition, and doesn't look anywhere near the 25 or so years old it must be. It uses EPROMS for sound storage - one seems to be missing. The amazing thing is that despite its ramshackle internal appearance (the largest veroboard circuitboard is also wobbly, because there is nothing to support the top) it partially works. Four of the sounds trigger and are well usable in all their 8-bit retro glory, and in theory it should be possible to get everything back to working order without too much difficulty. 240V, standard UK mains plug. BUT ONCE AGAIN, PLEASE NOTE THIS MUST BE MADE SAFE BY A COMPETENT ELECTRONICS ENGINEER BEFORE USE.